True if table is current, false if table is next. It is the responsibility of the subclasses to set the valid flag. The table id can be modified by subclasses only. XML table or descriptor name. Abstract base class for MPEG PSI/SI tables with long sections. [in] xml_name Table name, as used in XML structures. [in] standards A bit mask of standards which define this structure. [in] version_ Table version number. [in] is_current_ True if table is current, false if table is next. This method serializes a table. [in,out] duck TSDuck execution context. [out] bin A binary table object. Its content is replaced with a binary representation of this object. This method deserializes a binary table. In case of success, this object is replaced with the interpreted content of bin. In case of error, this object is invalidated. [in] bin A binary table to interpret according to the table subclass. This method checks if a table id is valid for this object. [in] tid A table id to check. True if tid is a valid table id for this object, false otherwise. 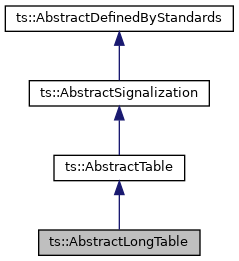 The default implementation checks that tid is identical to the table id of this object. Reimplemented in ts::SDT, ts::EIT, and ts::NIT. This abstract method serializes the content of a table. This method is invoked by serialize() when the table is valid. Implemented in ts::SDT, ts::EIT, ts::VCT, ts::PMT, ts::AbstractTransportListTable, ts::AIT, ts::MGT, ts::INT, ts::STT, ts::SelectionInformationTable, ts::SpliceInformationTable, ts::TOT, ts::RST, ts::AbstractDescriptorsTable, ts::PAT, ts::DiscontinuityInformationTable, and ts::TDT. This abstract method deserializes the content of a binary table. Check if this object is valid. True if this object is valid. This object must be rebuilt. Get the XMl node name representing this table or descriptor. This method converts this object to XML. When this object is valid, the default implementation of toXML() creates a root node with the default XML name and then invoke buildXML() to populate the XML node. Subclasses have the choice to either implement buildXML() or toXML(). If the object is serialized as one single XML node, it is simpler to implement buidlXML(). 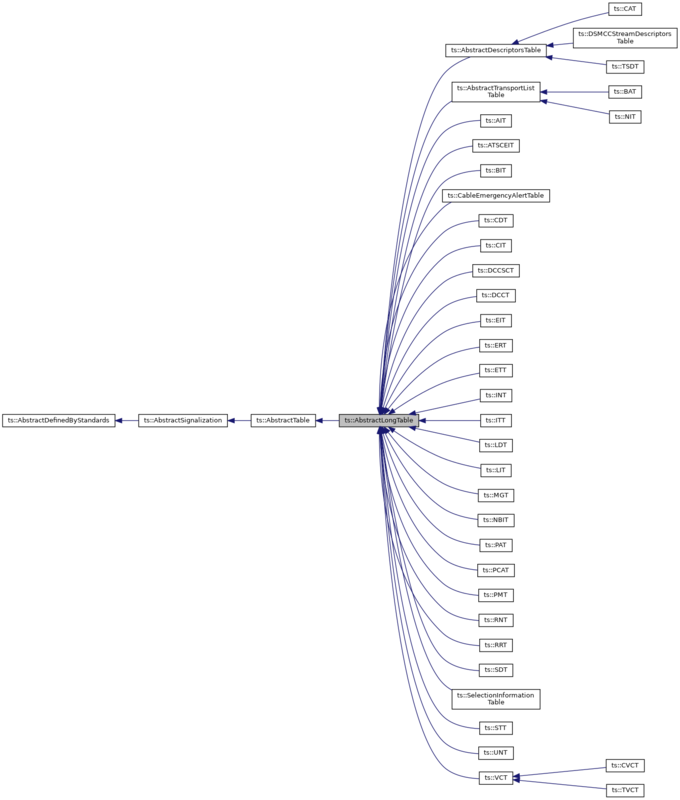 [in,out] parent The parent node for the new XML tree. Reimplemented in ts::SSULinkageDescriptor, and ts::SSUDataBroadcastIdDescriptor. This abstract converts an XML structure to a table or descriptor. In case of success, this object is replaced with the interpreted content of the XML structure. In case of error, this object is invalidated. [in] element XML element to convert. Implemented in ts::SDT, ts::EIT, ts::PMT, ts::VCT, ts::LinkageDescriptor, ts::TeletextDescriptor, ts::SSULinkageDescriptor, ts::TransportProtocolDescriptor, ts::SpliceInsert, ts::AIT, ts::SSUDataBroadcastIdDescriptor, ts::SpliceSchedule, ts::VBIDataDescriptor, ts::CADescriptor, ts::INT, ts::NPTReferenceDescriptor, ts::LogicalChannelNumberDescriptor, ts::HDSimulcastLogicalChannelDescriptor, ts::MGT, ts::STT, ts::EutelsatChannelNumberDescriptor, ts::ISO639LanguageDescriptor, ts::ParentalRatingDescriptor, ts::ServiceListDescriptor, ts::SubtitlingDescriptor, ts::SelectionInformationTable, ts::ExternalApplicationAuthorizationDescriptor, ts::SpliceSegmentationDescriptor, ts::DIILocationDescriptor, ts::ApplicationRecordingDescriptor, ts::TOT, ts::ApplicationSignallingDescriptor, ts::ExtendedEventDescriptor, ts::TargetIPSourceSlashDescriptor, ts::TargetIPv6SourceSlashDescriptor, ts::NIT, ts::PrefetchDescriptor, ts::RST, ts::AudioPreselectionDescriptor, ts::NVODReferenceDescriptor, ts::LocalTimeOffsetDescriptor, ts::TargetIPSlashDescriptor, ts::TargetIPv6SlashDescriptor, ts::TargetMACAddressRangeDescriptor, ts::ApplicationDescriptor, ts::SpliceInformationTable, ts::MultilingualServiceNameDescriptor, ts::ShortEventDescriptor, ts::EacemPreferredNameListDescriptor, ts::HEVCVideoDescriptor, ts::EnhancedAC3Descriptor, ts::DataBroadcastIdDescriptor, ts::ContentDescriptor, ts::CountryAvailabilityDescriptor, ts::DSMCCStreamDescriptorsTable, ts::TargetIPAddressDescriptor, ts::TargetIPv6AddressDescriptor, ts::BAT, ts::SpliceDTMFDescriptor, ts::TargetMACAddressDescriptor, ts::AbstractMultilingualDescriptor, ts::AC3Descriptor, ts::AVCTimingAndHRDDescriptor, ts::AVCVideoDescriptor, ts::PAT, ts::TerrestrialDeliverySystemDescriptor, ts::MessageDescriptor, ts::ApplicationStorageDescriptor, ts::IPMACGenericStreamLocationDescriptor, ts::IPMACStreamLocationDescriptor, ts::SatelliteDeliverySystemDescriptor, ts::SpliceTimeDescriptor, ts::TargetSmartcardDescriptor, ts::CAIdentifierDescriptor, ts::CueIdentifierDescriptor, ts::DTSDescriptor, ts::GraphicsConstraintsDescriptor, ts::HEVCTimingAndHRDDescriptor, ts::HierarchyDescriptor, ts::IPMACPlatformNameDescriptor, ts::IPMACPlatformProviderNameDescriptor, ts::TargetSerialNumberDescriptor, ts::VideoStreamDescriptor, ts::ApplicationIconsDescriptor, ts::ComponentDescriptor, ts::DVBJApplicationLocationDescriptor, ts::ISPAccessModeDescriptor, ts::MaximumBitrateDescriptor, ts::PartialTransportStreamDescriptor, ts::ServiceAvailabilityDescriptor, ts::ServiceDescriptor, ts::TimeSliceFECIdentifierDescriptor, ts::ApplicationUsageDescriptor, ts::DVBHTMLApplicationBoundaryDescriptor, ts::DVBHTMLApplicationDescriptor, ts::DVBHTMLApplicationLocationDescriptor, ts::IPSignallingDescriptor, ts::S2SatelliteDeliverySystemDescriptor, ts::SpliceAvailDescriptor, ts::StreamEventDescriptor, ts::AACDescriptor, ts::AC4Descriptor, ts::CableDeliverySystemDescriptor, ts::CPDescriptor, ts::DataBroadcastDescriptor, ts::DVBJApplicationDescriptor, ts::EacemPreferredNameIdentifierDescriptor, ts::EacemStreamIdentifierDescriptor, ts::NPTEndpointDescriptor, ts::SimpleApplicationBoundaryDescriptor, ts::SimpleApplicationLocationDescriptor, ts::SupplementaryAudioDescriptor, ts::AssociationTagDescriptor, ts::AudioStreamDescriptor, ts::DeferredAssociationTagsDescriptor, ts::RegistrationDescriptor, ts::ServiceIdentifierDescriptor, ts::T2MIDescriptor, ts::BouquetNameDescriptor, ts::ECMRepetitionRateDescriptor, ts::IBPDescriptor, ts::MultiplexBufferUtilizationDescriptor, ts::NetworkNameDescriptor, ts::ServiceMoveDescriptor, ts::ServiceRelocatedDescriptor, ts::StreamModeDescriptor, ts::SystemClockDescriptor, ts::TargetBackgroundGridDescriptor, ts::TransportStreamDescriptor, ts::VideoWindowDescriptor, ts::AdaptationFieldDataDescriptor, ts::AncillaryDataDescriptor, ts::CarouselIdentifierDescriptor, ts::CopyrightDescriptor, ts::DTSNeuralDescriptor, ts::PrivateDataIndicatorDescriptor, ts::PrivateDataSpecifierDescriptor, ts::ProtectionMessageDescriptor, ts::ScramblingDescriptor, ts::SmoothingBufferDescriptor, ts::STDDescriptor, ts::StreamIdentifierDescriptor, ts::StuffingDescriptor, ts::TimeShiftedEventDescriptor, ts::CIAncillaryDataDescriptor, ts::CPIdentifierDescriptor, ts::DataStreamAlignmentDescriptor, ts::ExternalESIdDescriptor, ts::MPEG4AudioDescriptor, ts::MPEG4VideoDescriptor, ts::SLDescriptor, ts::TimeShiftedServiceDescriptor, ts::DiscontinuityInformationTable, ts::MultilingualComponentDescriptor, ts::TDT, and ts::AbstractDescriptorsTable. Get the list of standards which define this object. A bit mask of standards. Helper method to convert this object to XML. The default implementation is to do nothing. Subclasses which override toXML() do not need to implement buildXML() since it won't be invoked. [in,out] root The root node for the new XML tree. Reimplemented in ts::SDT, ts::EIT, ts::VCT, ts::PMT, ts::LinkageDescriptor, ts::AIT, ts::TeletextDescriptor, ts::MGT, ts::INT, ts::TransportProtocolDescriptor, ts::SpliceInsert, ts::SpliceSchedule, ts::VBIDataDescriptor, ts::STT, ts::CADescriptor, ts::NPTReferenceDescriptor, ts::LogicalChannelNumberDescriptor, ts::HDSimulcastLogicalChannelDescriptor, ts::SelectionInformationTable, ts::SpliceInformationTable, ts::EutelsatChannelNumberDescriptor, ts::ISO639LanguageDescriptor, ts::ParentalRatingDescriptor, ts::ServiceListDescriptor, ts::SubtitlingDescriptor, ts::TOT, ts::RST, ts::NIT, ts::ExternalApplicationAuthorizationDescriptor, ts::SpliceSegmentationDescriptor, ts::DIILocationDescriptor, ts::ApplicationRecordingDescriptor, ts::AbstractDescriptorsTable, ts::ApplicationSignallingDescriptor, ts::ExtendedEventDescriptor, ts::TargetIPSourceSlashDescriptor, ts::TargetIPv6SourceSlashDescriptor, ts::PrefetchDescriptor, ts::AudioPreselectionDescriptor, ts::NVODReferenceDescriptor, ts::LocalTimeOffsetDescriptor, ts::TargetIPSlashDescriptor, ts::TargetIPv6SlashDescriptor, ts::TargetMACAddressRangeDescriptor, ts::ApplicationDescriptor, ts::MultilingualServiceNameDescriptor, ts::ShortEventDescriptor, ts::DSMCCStreamDescriptorsTable, ts::EacemPreferredNameListDescriptor, ts::PAT, ts::BAT, ts::HEVCVideoDescriptor, ts::EnhancedAC3Descriptor, ts::DataBroadcastIdDescriptor, ts::ContentDescriptor, ts::CountryAvailabilityDescriptor, ts::TargetIPAddressDescriptor, ts::TargetIPv6AddressDescriptor, ts::SpliceDTMFDescriptor, ts::TargetMACAddressDescriptor, ts::AbstractMultilingualDescriptor, ts::AC3Descriptor, ts::AVCTimingAndHRDDescriptor, ts::AVCVideoDescriptor, ts::TerrestrialDeliverySystemDescriptor, ts::MessageDescriptor, ts::ApplicationStorageDescriptor, ts::IPMACGenericStreamLocationDescriptor, ts::IPMACStreamLocationDescriptor, ts::SatelliteDeliverySystemDescriptor, ts::SpliceTimeDescriptor, ts::TargetSmartcardDescriptor, ts::CAIdentifierDescriptor, ts::CueIdentifierDescriptor, ts::DiscontinuityInformationTable, ts::DTSDescriptor, ts::GraphicsConstraintsDescriptor, ts::HEVCTimingAndHRDDescriptor, ts::HierarchyDescriptor, ts::IPMACPlatformNameDescriptor, ts::IPMACPlatformProviderNameDescriptor, ts::TargetSerialNumberDescriptor, ts::VideoStreamDescriptor, ts::ApplicationIconsDescriptor, ts::ComponentDescriptor, ts::DVBJApplicationLocationDescriptor, ts::ISPAccessModeDescriptor, ts::MaximumBitrateDescriptor, ts::PartialTransportStreamDescriptor, ts::ServiceAvailabilityDescriptor, ts::ServiceDescriptor, ts::TDT, ts::TimeSliceFECIdentifierDescriptor, ts::ApplicationUsageDescriptor, ts::DVBHTMLApplicationBoundaryDescriptor, ts::DVBHTMLApplicationDescriptor, ts::DVBHTMLApplicationLocationDescriptor, ts::IPSignallingDescriptor, ts::S2SatelliteDeliverySystemDescriptor, ts::SpliceAvailDescriptor, ts::StreamEventDescriptor, ts::AACDescriptor, ts::AC4Descriptor, ts::CableDeliverySystemDescriptor, ts::CPDescriptor, ts::DataBroadcastDescriptor, ts::DVBJApplicationDescriptor, ts::EacemPreferredNameIdentifierDescriptor, ts::EacemStreamIdentifierDescriptor, ts::NPTEndpointDescriptor, ts::SimpleApplicationBoundaryDescriptor, ts::SimpleApplicationLocationDescriptor, ts::SupplementaryAudioDescriptor, ts::AssociationTagDescriptor, ts::AudioStreamDescriptor, ts::DeferredAssociationTagsDescriptor, ts::RegistrationDescriptor, ts::ServiceIdentifierDescriptor, ts::T2MIDescriptor, ts::BouquetNameDescriptor, ts::ECMRepetitionRateDescriptor, ts::IBPDescriptor, ts::MultiplexBufferUtilizationDescriptor, ts::NetworkNameDescriptor, ts::ServiceMoveDescriptor, ts::ServiceRelocatedDescriptor, ts::StreamModeDescriptor, ts::SystemClockDescriptor, ts::TargetBackgroundGridDescriptor, ts::TransportStreamDescriptor, ts::VideoWindowDescriptor, ts::AdaptationFieldDataDescriptor, ts::AncillaryDataDescriptor, ts::CarouselIdentifierDescriptor, ts::CopyrightDescriptor, ts::DTSNeuralDescriptor, ts::PrivateDataIndicatorDescriptor, ts::PrivateDataSpecifierDescriptor, ts::ProtectionMessageDescriptor, ts::ScramblingDescriptor, ts::SmoothingBufferDescriptor, ts::STDDescriptor, ts::StreamIdentifierDescriptor, ts::StuffingDescriptor, ts::TimeShiftedEventDescriptor, ts::CIAncillaryDataDescriptor, ts::CPIdentifierDescriptor, ts::DataStreamAlignmentDescriptor, ts::ExternalESIdDescriptor, ts::MPEG4AudioDescriptor, ts::MPEG4VideoDescriptor, ts::SLDescriptor, ts::TimeShiftedServiceDescriptor, and ts::MultilingualComponentDescriptor. Check that an XML element has the right name for this table. [in] element XML element to check. This static method serializes a DVB string with a required fixed size. [in,out] bb A byte-block where str will be appended if its size is correct. [in] str String to serialize. [in] size Required size in bytes of the serialized string. True if the size has the required length and has been serialized. This static method serializes a 3-byte language or country code.